I found this recipe in Taste of Home magazine a few years ago, and I make it every Christmas. I have never made the glaze because it's simply delicious without it. 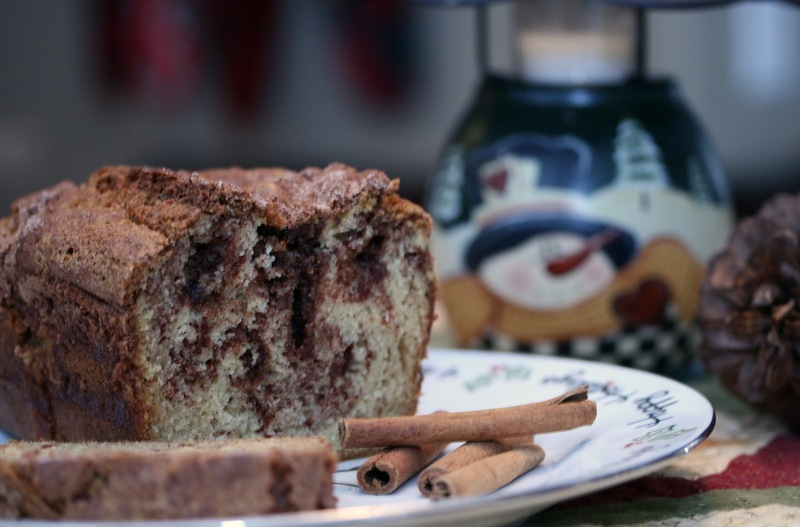 If you're a cinnamon lover like I am then you will love this bread! Combine 1/2 cup of sugar and the cinnamon and set aside. In a large mixing bowl, sift together the flour, baking soda, salt and remaining sugar. remaining batter and sprinkle with remaining cinnamon- sugar; swirl a knife through the batter. Bake at 350F for 45-50 minutes or until a toothpick inserted near the center comes out clean. Cool in pan for 10 minutes before removing to a wire rack to cool completely. Combine the glaze ingredients; drizzle over the cooled bread. Makes 1 loaf. Tip: If you don't have buttermilk on hand here's a great substitute: in a measuring cup, pour just under one cup of milk. Add 1 Tablespoon of white vinegar or lemon juice. Stir and let set for 5 minutes, then use as much as your recipe calls for.